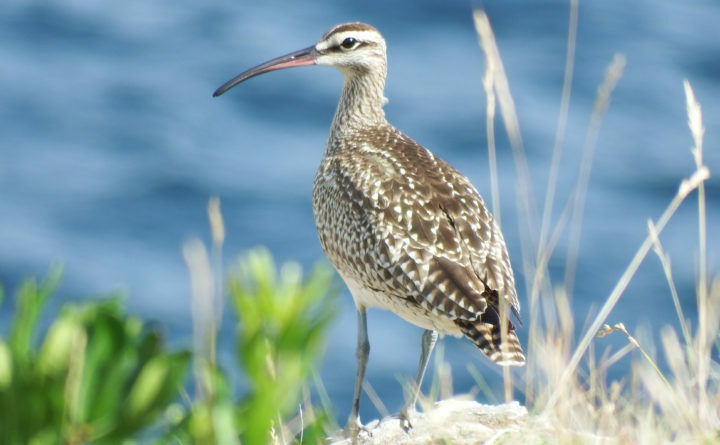 Whimbrels are large shorebirds that often forages in fields, eating bugs and berries. Their long, down-curved bill can be used like chopsticks. A bird is evolution taken to extremes. In order to fly, birds replaced arms with wings. The vestigial finger bones are still there, but they have elongated to support the flight feathers. Certainly the ability to fly has served birds well, but you would think that the loss of arms is a big disadvantage. Perhaps it would be, except that birds developed specialized bills to compensate for the loss. Bird beaks are the Swiss army knives of the natural world. The words bill and beak are interchangeable. Bill comes from the Old English, while beak is derived from Old French. Every bill solves a problem. Let’s say you are a whimbrel, a large shorebird that often forages in fields, eating bugs and berries. You’re a foot tall. How do you reach the ground? You could bend over, but that’s tiring, and with your head down, it leaves you vulnerable to a sneak attack from above. The answer: grow a long, down-curved bill that you can use like chopsticks. The American woodcock also has a long bill. But the bird is squat and short-legged, with eyes placed so far back on the head that it can spy danger from nearly any angle. The woodcock does not pick up food the way the whimbrel does. Rather, it uses its bill to probe for worms and other invertebrates in the mud. The tips of its bill are sensitive enough to feel prey when touched, and the outer tips can be opened independently from the rest of the bill to grasp the morsel like tweezers. Ingenious. For the past couple of weeks, there has been a roseate spoonbill in Dover-Foxcroft. It’s a tall, pink wading bird that is normally found in the southern United States. This is the first of its kind ever spotted in Maine. Spoonbills have a large, flattened, spatula-shaped bill that they swing from side to side in the water, straining out shrimp and other tiny invertebrates. Black skimmers are the only birds in North and South America that feed by flying along a wetland while dipping their bills in the water. The bottom mandible is longer than the top, allowing it to efficiently slice through the water until it feels something worth swallowing. Charles Darwin developed much of his Theory of Evolution while observing finches in the Galapagos Islands off Ecuador. He noticed that isolated populations of finches on different islands had developed unique bills, suited to the food to be found on each. Even today, scientists are measuring the physical changes in these same finches as the birds adapt to modern conditions. Back in the United States, this phenomenon is widespread. Red crossbills are finches with unique bills that cross at the tip, enabling them to scissor off cones. In some isolated patches of island forest, there is an adaptation war going on. The trees are growing bigger cones, so that the crossbills can’t eat them all. But the crossbills are keeping up, evolving larger bills. Likewise, hummingbirds in the tropics evolve longer bills in order to reach the nectar in ever-deepening blossoms. The sword-billed hummingbird of the Andes in South America has a bill that is longer than its body. Natural selection happens much faster than previously thought. Now think about all the common birds you know. Robins need a bill that is strong enough to pull a reluctant worm from the ground, yet dexterous enough to pluck a berry from a mountain ash. Sparrows and finches need heavy bills that can crack a seed. Warblers and vireos need long, thin bills for gleaning insects under leaves. Nighthawks, swallows and flycatchers need flatter, wider bills that can scoop up insects in the air. What about those birds that eat both seeds and insects? Their bills are a compromise. The bill of a chickadee is strong enough to crack a sunflower seed, yet slim enough to glean insects under leaves. They’re not suitable for chasing insects on the wing. Raptors need hooked bills that tear flesh. Herons and loons have long, pointed bills that spear fish. Woodpecker bills are chisels. Pelican bills are pouches. Flamingos filter feed while holding their heads upside down underwater. Bill shapes are so distinctive that they can help make a difficult identification easier. Let’s face it, there are a lot of tiny birds out there, all about the same size. Bill shapes provide clues on how the birds act and forage. In the bird world, you are what you eat.